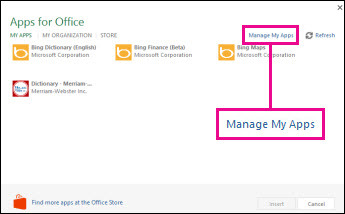 If one of your Office Add-ins isn’t showing up in your list, it might have been hidden. Or, if it was a trial add-in, the trial might have expired. 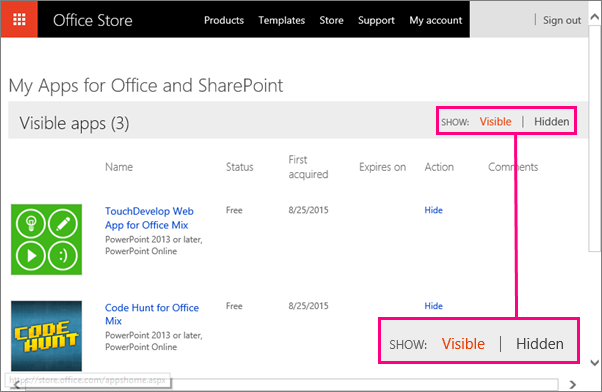 Use the My Apps for Office and SharePoint page to check the status of your apps and retrieve hidden apps. Note: New name for apps for Office - Office Add-ins. We are currently updating our products, documentation, samples, and other resources to reflect the platform name change from "apps for Office and SharePoint" to "Office and SharePoint Add-ins". We made this change to better distinguish the extension platform from Office apps (applications). While these changes are taking place, the dialogs and messages you see in your application might be different than what you see in this article. 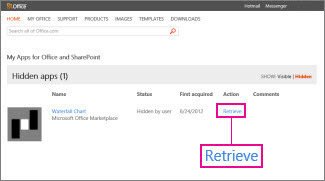 Use the My Office Add-ins and SharePoint page in Office 2016 to check your add-in’s status and retrieve hidden add-ins. In Word 2016, Excel 2016, or PowerPoint 2016 click Insert > My Add-ins. In Project 2016, click Project > My Add-ins. The My Apps for Office and SharePoint webpage will open. Next to Show, click Hidden. Find the add-in and then under Action, click Retrieve. Go back to Word 2016, Excel 2016, or PowerPoint 2016, and click Insert > My Add-ins to see your list of Office Add-ins. In Project 2016, click Project > My Add-ins. Note: If the add-in you retrieved isn’t showing up, click Refresh to update the list. 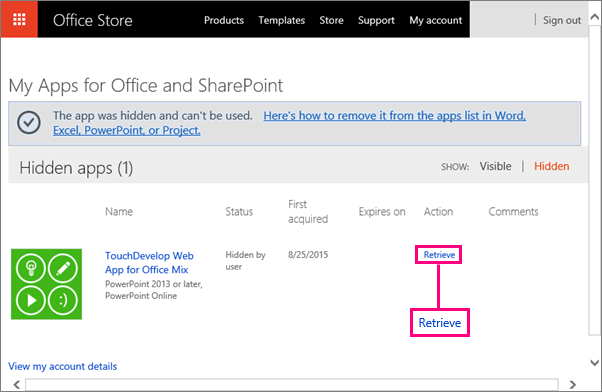 If one of your apps isn’t showing up in the apps for Office list, it may have been hidden. Or, if it was a trial app, the trial may have expired. 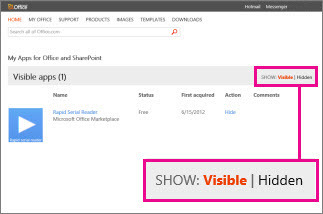 Use the My Apps for Office and SharePoint page to check your app’s status and retrieve hidden apps. In Word 2013, Excel 2013, or PowerPoint 2013 click Insert > My Apps. In Project 2013, click Project > Apps for Office. If you don’t see Manage My Apps, click My Apps. Find the app and then, under Action, click Retrieve. Go back to Word 2013, Excel 2013, PowerPoint 2013, or Project 2013 and refresh the apps for Office list using the steps above.